My serious intellectual life began in 1944 at the age of five when a kindergarten classmate told me that God is a person. I checked with my father about this, and he said, “No, Jesus was a person but God is more like electricity or light.” This seemed reasonable and triggered in me a decisive love of God. Electricity makes things go, like my electric train, and my father explained that God makes everything go, which remains my theology to the present day (albeit in ways even my father could not imagine). Light is precious and comforting to a child afraid of the dark, as I was. I also understood in my childish way the metaphoric reach of light-coming-up-at-dawn as a symbol of creation. My wise father was a chemist who considered himself an atheist because he thought theists had to believe in a personal God. He was convinced that church was good for moral cultivation, however, and sang in the choir, was lay leader of the congregation, and taught the adult Sunday School class for about twenty years. My brother and I were brought up in a church culture and our mother went along with that, though without enthusiasm for church dinners. I grew up through high school years in a Methodist Church in St. Louis, Missouri, where most of the people did believe that God is a person. I never did, nor have I since; so I never had to get over a belief in a personal God, a transition so traumatic for many people. On the other hand, I developed a deep appreciation for Jesus as a person, as my father said, though I never thought of him as particularly divine, except in such symbols as being the “light of the world.” From kindergarten, then, I was set on the trajectory of being a liberal, metaphysically oriented, Methodist pietist. The spiritual life of the youth group in my church was built around Norman Vincent Peale’s Guideposts magazine, a liberal psychologically oriented positive approach to life. Later, during sophomore year in college, I briefly came to accept the Neo-Orthodox critique of “the power of positive thinking.” But the recent development of “positive psychology” is vindicating Peale in many respects. The titillating attraction of the narrative of Neo-Orthodox theology seems to me now to be limited to the needs of a college sophomore in the throes of seeking an existential identity. The second major event of my intellectual life took place when I was a sophomore in high school. Walking down the hall one day, my English teacher, Roy Dripps, said, “You know, Bob, God is not in time.” I forgot what we were talking about, but knew in an instant that something important had happened. For the first time I conceived of God as the creator of time, and space, and therefore as not temporal. Moreover, I knew that this was a peculiar kind of idea, and that I was at home with it. In that moment I realized that many people cannot think this kind of idea, which is why they have to think of God as a person who interacts with things within space and time. Not until I studied philosophy in college did I find out what kind of thinking this is, metaphysics, but I knew from that day in high school that I wanted to spend my life with ideas like that. The conception of God as creator of time and space has been central to my philosophical theology ever since. While in high school, I was also editor of our local church newsletter. My very first publications were several 500 word essays in the newsletter on various world religions, based on encyclopedia articles. No blind reviewing for me! It was my conviction then that Christianity should think of itself as one religion among others and that Christians should know about the others. Today, theology of world religions is promoted as a hot new field, and I’ve made something of a career as a comparativist, advancing beyond encyclopedias to at least the next level of research. But all that seemed obvious to me at fifteen and I have only been working out the details for the last fifty or sixty years. I defended my doctoral dissertation on divine creation when I was twenty three. Some people think that was precociously young, but, you see, I had been working on it for eighteen years, eighteen of the most flexible and imaginative years for absorbing ideas and thinking without many prejudices. The most important teacher of my college and graduate school was John E. Smith. As a scholarship student I was assigned to be his typist beginning sophomore year and worked for him two hours a day, five days a week until I finished my undergraduate degree. For an hour and three quarters each day we talked about philosophy and life; then for fifteen minutes I typed and took his dictation directly on a little Smith-Corona portable typewriter (typewriters were ancient tools for writing, like cuneiform wedges). At the end of three years I had the equivalent of about eighteen courses of private tutorials with one of the smartest philosophers alive, and could type 120 words a minute. Early in my freshman year I had become a Humean, having learned in an afternoon to classify all things as ideas or impressions; sophomore year I was an existentialist, steeped in Kierkegaard and Tillich. Junior year I began reading pragmatism in John Smith’s classes, as well as with Richard Bernstein; Bernstein, Weiss, and Smith were my dissertation committee. Smith’s seminar on Dewey and Royce was the pivotal experience in setting my philosophical orientations and directions. I also took four seminars on Kant’s First Critique with him and three on Hegel’s Lesser Logic: Kant and Hegel are the two philosophers any pragmatist has to get over and around. But Smith was influential in another way as well. As a church-going teenager it had seemed natural to me to become ordained, although I never seriously entertained a career in parish ministry. At fifteen I was licensed as a local preacher in the Methodist Church and at seventeen did serve a summer parish before heading off to college. But at college I encountered all the ideas that make it so hard to be religious and seriously educated at once. Yale held up a mirror in which I saw the superficiality and credulity of the folk-religion of my teenage years, as I thought. If it had not been for a chance reading of Tillich’s The Courage to Be at the end of my freshman year, I would have abandoned my whole religious identity in shame. Tillich saved my life. The Courage to Be showed me that one could not be seriously educated, at least in philosophy and the arts, without being religious in Tillich’s sense. But it was John Smith, who had been Tillich’s student at Union Seminary, who showed me how to live the philosophical religious life. He was an ordained Presbyterian with an academic philosophical career. His main topic was philosophy of religion, and to this day I cannot say with much clarity where his ideas leave off and mine begin. But it was his person that was most instructive. He was an extraordinarily imaginative philosopher, passionately engaged with the institutional and academic issues of his day, who thought and lived in the “depth dimension,” as Tillich would say and as I wished I could. John died in December of 2009 and I preached his funeral, burying him in the Grove Street Cemetery in New Haven. I still feel bereft, as of a parent. How fortunate I am to be among the few who have had teachers dear enough to grieve! 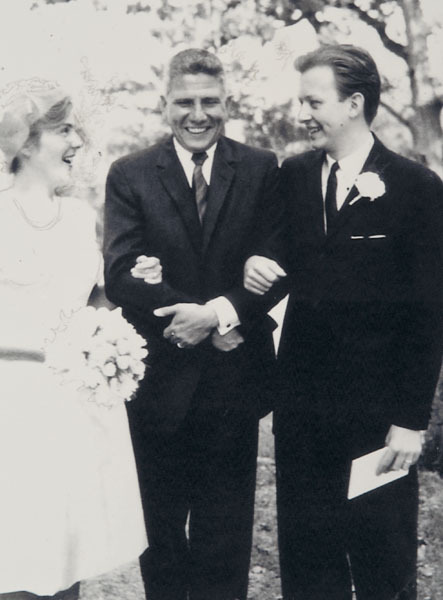 John E. Smith after marrying Elizabeth Egan and Robert Neville. On June 8, 1963 I married Beth Egan; John Smith performed the service. Earlier in that week I had received my doctorate. The following September I began a two-year stint as a philosophy Instructor at Yale, and a few months later I was ordained a deacon in the Methodist Church. Marriage, teaching, and research were the main venues of my intellectual biography after formal schooling. The years teaching at Yale were notable for learning how to be a married man, for learning how to teach—mainly courses in American philosophy, and for revising my dissertation. In 1965 I went to Fordham University, my first real job. I was the first Protestant to be hired at that Jesuit university to teach philosophy or theology and it was a time of high enthusiasm for the Roman Catholics there. Several of my colleagues had been at the Second Vatican Council and the fever for reform was high. To understand my own response, however, I have to tell two more stories from my childhood in St. Louis. Our neighborhood was almost entirely Roman Catholic, with only one other Protestant family in my grade school, to my knowledge. The recent immigration of Italians was pushing hard on the earlier Irish and German Catholics, with some tense culture-clashes. When I was ten and eleven I led a gang of Irish and German Catholic kids against the Italian gang. We were too young for serious gang warfare, although we did carry hunting knives and had battles throwing bottlecaps at one another, hoping (and fearing) to slice the enemy’s eyes—we never did. In my gang, I insisted we speak only Pig Latin, which remains my best second language; we were the Tomahawk Gang, that is, the Omahawktays. Most of our activity was holding “peace” conferences to work out turf boundaries. (Remember, this was the late 1940s when the grownups were doing the same thing.) At the last conference, held in the garage of my gangleader counterpart, Mario Italiano, I went in alone and was immediately jumped. They tied me up with BX cable, which tells you something about their intelligence. I shimmied out of the bonds and gave a shout for the Tomahawks, who of course were secretly hidden around the garage and who swept through in superior numbers. Meanwhile I grabbed Mario, turned him upside down and was about to drop him on his head when he drew his knife and stabbed my thigh, deep, surely to the bone I thought. The shock of that stopped all fighting. I put a piece of adhesive tape over the wound and never told my mother. And I retired as gangleader. The lesson I learned from that had nothing to do with gang warfare. It was that I was good at leading and organizing. There is a straight line from Mario’s garage to the dean’s office at Boston University. And I knew what it was like to be a lone Protestant among Roman Catholics. The second childhood story has more to do with religion. Sure, I was religious in the churchy ways I’ve described, but my real religion was baseball. My ultimate concern was with the St. Louis Cardinals and the worship of Stan Musial and Marty Marion. Though not much of a hitter, Marty Marion was the sweetest, most graceful shortstop ever. His player number was 4, which, as many people know, has been the organizing number of my literary output. To be respectable, I attribute the use of 4 to the four parts of Plato’s “Divided Line,” but its real provenance is Marty Marion the shortstop. Part of my worship was to aspire to be a baseball player myself. So I organized a team, at the age of 12, gathering about 20 of the boys from our neighborhood, talking the owner of a gas station into buying us tee-shirts with a team logo, and persuading the father of one of the boys to be our coach. I even enrolled us in one of the local leagues, with a playing schedule. Truly, I was a dean in the making. But the tragedy of administration was brought home to me early. After the first few games of the season my family took a two-week vacation, so I missed the next two games. The day we returned I was told by a teammate that I had been dropped from the team. Now to be sure, I was a terrible player—I couldn’t hit, or catch, or run aggressively, and I was afraid of the ball. But to be thrown off the team I had created was just devastating. My diary gives the date as June 29, 1951, and shortly after I stopped writing in the diary. The only consolation was to see my father in a helpless rage at the injustice of it all, furious that he could not tell the coach I deserved a place on the team because I had created it. Later that summer my brother threw my baseball glove onto the roof of the grade school where it was found by a janitor several years later, rotted to pieces but with my name on it; it was a Marty Marion glove. So baseball proved not to be a proper object of ultimate concern. And I learned that administrative leadership can be a thankless job. My move to Fordham in 1965 thus was a return to the Catholic world. At first I had a hard time calling my colleagues “father” but after a while I became comfortable with that, with starting classes with the Lord’s Prayer, and with coping with students fleeing their religious heritage. The enthusiasm for inventing a new, liberal, philosophically open, university at Fordham was heady. In 1966 I became chair of the undergraduate department of philosophy and we revised the curriculum, going from 3 to 150 majors in two years. That year I was invited to give a paper at the University of Chicago and after the talk was asked to take a position there. My wife and I decided to stay in New York, she for the sake of the art scene and I because there seemed to be such good energy at Fordham. When I declined the Chicago position they gave it to David Tracy, and I have often wondered what my career would have been like had I gone there. When I discovered this last year that it was Paul Tillich’s chair that I declined, the “what if” wonder came back stronger than ever. But I have no complaints about the jobs I have had. The first semester at Fordham I taught a doctoral seminar on Charles Peirce, and from that found my first doctoral student, Elizabeth Kraus, who subsequently wrote The Metaphysics of Experience: A Companion to Whitehead’s Process and Reality . I’ve been blessed with good doctoral students ever since, some truly great. My first book, God the Creator , came out in 1968, arguing that anything that is determinate has to be created, and that the creator is an act, not a being. The radical and unsettling character of that claim, relative to monotheistic orthodoxy, was disguised by two things. First, I framed the main points in medieval terms, defending Scotus’ priority of will over nature in God against Aquinas’ priority of nature over will; people thought that if it was medieval it had to be ok at Fordham. Second, the book was published in 9-point type that one reviewer said was as dense and hard to read as the argument itself. The process philosophers, however, got my point immediately and ever since have been defending Whitehead against my alternative. My book, Creativity and God: A Challenge to Process Theology (1980), is a collection of essays and reviews critical of process theology and it continues to be one of my best selling books because they remain worried by its arguments. One implication of the claim that God creates everything determinate is the fear that this makes free will impossible, as Calvin had said. I published The Cosmology of Freedom in 1974 to show that divine creation of my brand is compatible with spontaneous free choice, and many other dimensions of personal and social freedom. In this book I picked up and modified much of Whitehead’s metaphysics, which has become as integral to my thought as pragmatism. The late 1960’s and early 70’s was a time of radical ferment in social philosophy, and I was immersed in political, sociological, psychological, and anthropological theories. That was fortunate because I learned to hold my own with social scientists who now dominate the religious studies profession. The book on freedom originally had a part on spiritual freedom, in addition to personal and social freedom, but the publisher said the book was too long. So I rewrote the spiritual freedom section as Soldier, Sage, Saint , which came out in 1978. It was reviewed in the New York Times which quoted the line, “it is easier to be a saint than to live with one.” That line was used as a column-filler by the Times for many years, and it is quoted in a humor book next to a joke by Woody Allen, the closest I’ve ever come to greatness. I moved from Fordham to SUNY College at Purchase in 1971 where I stayed until 1977. Concurrently from 1971 to 1973 I was Associate for the Behavioral Sciences at the Hastings Center, which in those years was founding the discipline of bio-ethics. Those were exciting times, participating in writing the medical definitions of brain death and the legal definitions of informed consent; I published in medical and law journals out of that experience, and became an associate editor in later years of the Encyclopedia of Bioethics . Although I’ve continued to follow bio-ethics debates, they seem to me to be rehashing the old arguments of the 1970s, and my interest in basic metaphysical, epistemological, and religious issues has taken me away from the life of bio-ethical advocacy. One of the most important influences on me at Fordham was Thomas Berry, known to most of you as a “theologian of the Earth.” But to me he insisted that I not try to do philosophy or theology without knowing the East Asian and South Asian traditions. In fact he signed me up to teach courses in them, which I have done ever since. When my students at Purchase begged me to find them a Sanskrit teacher, Berry told me to teach them myself, and he taught me how to stay two weeks ahead of them; for two years I had the largest Sanskrit classes in the country, according to Berry. He also told me to learn Chinese and signed me up with a local teacher. Although I never learned enough Chinese to be useful, my teacher did give me a Chinese name which now goes on all my publications in Chinese, Nan Lo-Shan. From my experience with him I launched into an increasingly rigorous and fast-paced study of comparative philosophy and theology. Most of my writings on these topics have been papers rather than books, and I have gathered these into collections of essays, beginning with The Tao and the Daimon (1982), Behind the Masks of God (1991), Boston Confucianism (2000), and Ritual and Deference (2008). Behind the Masks of God and Boston Confucianism have been translated into Chinese, but I have no idea what they say! Perhaps my most important, but exhausting, work in comparative philosophy and theology was to direct the Cross-Cultural Comparative Religious Ideas Project at Boston University in the late 1990s. That project brought together a great many of the people who have since become important in comparative work, Francis Clooney, S.J., now at Harvard and directing the Center for World Religions, Livia Kohn, Nomanul Haq, Paula Fredriksen, John Thatamanil, Hugh Nicholson, James Miller, Peter Berger, John Berthrong, and Wesley Wildman, among others. Wesley and I co-authored several papers in the project which solidified what has become the most satisfying intellectual and collegial collaboration of my life. The three volumes that came out of that project are landmarks of comparative work with laudatory forewords by Peter Berger, Tu Weiming, and Jonathan Z. Smith. In 1977 I was asked to apply for a job in religious studies at SUNY Stony Brook, and on the drive for an interview from our house in Yonkers to Stony Brook on Long Island, I worked out in my mind what to tell the faculty there about my future research plans. I thought up a three-volume study called The Axiology of Thinking . Its overall thesis was that every kind of thinking involves valuing the objects thought in some sense or other. The first volume, Reconstruction of Thinking (which was published in 1981), had two parts. The first was a four-chapter analysis of the cost to modern culture of early modern science’s strict separation of fact, which can be known, from value, which cannot be, plus my version of a pragmatic theory of the cosmology of axiological judgment. The second part was a four-chapter analysis of imagination, first in terms of synthesis, extending Kant’s argument in the A Deduction of the Critique of Pure Reason while rejecting the transcendental B Deduction, second in terms of perception, developing a theory of beauty, third in terms of appearance, developing a theory of form and image, and fourth in terms of engagement, which required a theory of art. The second volume, Recovery of the Measure (1989), treated interpretation, in contrast to imagination. Interpretation can be true or false, whereas imagination can be perceptive, beautiful, and engaging but not true or false, strictly speaking. The first task of Recovery of the Measure was to develop a naturalistic, pragmatic theory of truth, which I defined as the carryover of value from the object interpreted into the interpreter’s experience in the respect in which the interpretive signs stand for the object. That hypothesis is a total rejection of the representationalist approach to knowledge. The second task of that volume was to develop the metaphysics for the theory of truth, treating identity, being, value, and harmony. The third task was to articulate a philosophical cosmology within which interpretation can be seen as a natural development within nature, elaborating theories of time, change through the interpretive process, motion through space, and causation. For this task I modified Whitehead’s cosmology in accord with my emphasis on value and continuity, modifications that carried me rather far from the master. The fourth task for Recovery of the Measure was to elaborate a naturalistic theory of intentionality and meaning that explicitly sidestepped the linguistic turn of analytic philosophy and the consciousness-obsession of much Continental philosophy, all in the name of metaphysical pragmatism. This metaphysical pragmatism goes well beyond the social pragmatism that is now popular and the neo-pragmatism of Richard Rorty and does not register in the sights of their friendly critics such as Richard Bernstein. But it is truer to the metaphysical interests of the classical pragmatists than the thinner programs of the pragmatisms now so popular. The third volume, Normative Cultures (1995), studied two more families of axiological thinking in addition to imagination and interpretation, namely theorizing and the pursuit of responsibility or practical reason. It developed a pragmatic theory of theory, elaborately answering post-modern criticisms directed against theory as such. As hypotheses, theories are vulnerable to correction and, although perhaps about foundational issues in metaphysics and cosmology, are themselves not foundational. With respect to practical reason, it argued that valuations in imagination, interpretation, and theory need to be given social form for the purposes of conjoint action, and it employed Confucian ritual theory to understand the conjoint action required for responsibility. The argument was also made that the broadest level of feedback for philosophical theorizing is the service the theory renders for guiding life. Following Plato rather than Aristotle, Normative Cultures says that theoretical reasoning is for the sake of guidance or practical reasoning, and is to be judged according to whether it provides a good guide for grasping what is important in life and how to attain it. The Axiology of Thinking’s treatment of four families of thinking, imagination, interpretation, theory, and responsible guidance, does indeed roughly follow the levels of Plato’s Divided Line, and does not derive only from the player’s number of Marty Marion. The Axiology of Thinking completed the work of my early period, my juvenilia, as it were. A collection of essays from the late 1980s and early 90s, The Highroad around Modernism (1992), engaged late modern debates about theory and practice and presented a sustained argument for pragmatic metaphysics in the face of post-modern criticisms. Earlier, in 1987, I had published The Puritan Smile: A Look toward Moral Reflection , a series of essays in which I developed a moral and political theory that picked up where The Cosmology of Freedom had left off. In 1987 Beth and I moved from Stony Brook to Boston University where I became chair of the religion department and director of the collaborative doctoral program in religious studies. The following year I became dean of the School of Theology, a position I held for fifteen years, with three years after that as the university chaplain and dean of Marsh Chapel, and four more years as director of the Danielsen Institute, the first of which overlapped the last Marsh Chapel year. I had been the administrator of just about every academic unit I had been in since 1966, including a three-year stint as Dean of Fine Arts and Humanities at Stony Brook. On the very first day of that job we discovered that the tenured piano tuner had gone deaf! My administrative work at Boston University, however, was a significantly deeper involvement in the care for institutions. As dean of the School of Theology I found myself on a number of national and international committees for the United Methodist Church and served many years on the national seminary accrediting agency, which provided many opportunities for testing my theories. Most of my administrative colleagues had no idea that I was a philosopher or theologian, only a church bureaucrat pushing for higher standards in theological education. I have been blessed with a series of bishops who have regularly prayed for me but never read my books; otherwise I might have been in trouble. With some comfort I learned that church politics is just as bad as academic politics, but no worse. I also learned that politics, literally “making a city,” means working with people who have different interests and perspectives, often in conflict with one’s own, to create and sustain institutions of value for all. So I have never been cynical—disappointed, frustrated, and angry, but never cynical. Learning to be wholly committed to building institutions, and losing almost as often as winning, marked the beginning of my middle period. I finally understood about my baseball team, my father’s rage, and my tears of loss. The School of Theology at Boston University is ecclesiastical as well as academic, and I found myself preaching frequently. Furthermore, I lived with students and faculty who were deeply committed to the internal language of Christian religiosity. The Roman Catholic world at Fordham was trying very hard to speak in secular ways. Stony Brook was largely a Jewish institution and any Christian language had to be spoken in private. At Boston University, by contrast, I had to come to terms with the symbols of Christianity as the sacred canopy under which the School operated. The heritage of theology at Boston University was not syrupy piety: Boston Personalism was rationalistic, science-friendly, and socially engaged in public affairs outside the church. The university itself was founded by the dean of the original Methodist seminary, William Fairfield Warren, who thought that theological education needs to take place within a secular center of learning. He himself was the first professor of comparative religion in American theological education, and was president of Boston University from 1869 to 1911, off and on, sometimes also serving as dean of the seminary. Bordon Parker Bowne, Edgar Sheffield Brightman, and Walter Muelder had Ph.D.s in philosophy, not theology. Howard Thurman and Martin Luther King, Jr., were publicly famous for taking the preaching rhetoric of Christianity into the public sphere of civil rights. They were equally important at Boston University, however, for making sure that religion is not mainly about the Church but about amending the world for the sake of which Christians and their Church should be prepared to sacrifice. So this was a natural and joyous heritage for me. But how can the traditional religious symbols be interpreted and deployed in continuity with this heritage and with respect to the issues of the last quarter-century? As dean of the School, I “volunteered” to teach the introductory theology course for which I wrote A Theology Primer (1991). That small volume treated the classic theological loci in terms of the philosophical and theological ideas of my emerging middle period. I am a text-based lectionary preacher, and learned to preach in the language of the Bible, not in my philosophical categories, but with hard-won principles of interpretation consonant with my pragmatic and process traditions. I published a book of sermons, The God Who Beckons in 1999 and another, Preaching the Gospel Without Easy Answers , in 2005. The latter was from the first year as dean of Marsh Chapel where I preached to the same congregation every Sunday and where I stayed long enough to preach through the entire three-year lectionary, a bracing discipline. I also published Eternity and Time’s Flow , in 1993. That long monograph has the general form of arguing for eternity as the matrix within which time flows, in metaphysical opposition to process philosophy. Its rhetorical form, however, is a re-inscribing of religious notions of resurrection and immortality into a sense of temporally limited presence within the concrete eternal act of creation. Many of my students these days are fallen-away evangelicals who are pleased to find in this book that they still can hold to a rich sense of eternal life, after they have abandoned the afterlife rewards and punishment imagery of their former religious imagination. During this time I was developing my own theory of religious symbolism, the main theme of my middle period, which was published in the monograph, The Truth of Broken Symbols , in 1996. Actually, I drafted most of that book as well as Normative Cultures during a brief leave in Cambridge University in the early 90s, and so there was an overlap of my early and middle period. The theory of religious symbolism was then employed to develop a systematic Christology, published as Symbols of Jesus: A Christology of Symbolic Engagement in 2001. Symbols of Jesus also was drafted in Cambridge University where I was surrounded with religious symbols in art, music, and architecture, as well as high and low liturgies. I should say at this point that all of my writings since my marriage to Beth Neville have been much influenced by art, mainly her art, and by living in the world of artists. She has created the covers for most of my books. Symbols of Jesus has several color plates of her 49 foot long painting, “From Caves to Cosmos,” and the volume is dedicated to her. That book gives contemporary interpretations, consonant with my metaphysics and religious practice, of Jesus as the atonement, as the Cosmic Christ, Alpha and Omega, as the Second Person of the Trinity, as an historical figure, as the deepest spiritual friend for Christians, and as the Way, the Truth, and the Life. My collection of essays, Religion in Late Modernity (2002), treats specific problems in religious symbolism, particularly personification of the ultimate in anthropomorphic terms, as well as issues in the contemporary interpretation of religion. Another collection, Realism in Religion: A Pragmatist’s Perspective (2009), includes essays from the beginning of my career until the last couple of years. One essay, on Descartes and Leibniz, started as a graduate school term paper and is the last paper I wrote in the conventional genre of compare and contrast; I paralleled their debate about the priority of nature and will in God to Tillich and Hartshorne, respectively. My late, or mature, period of writing begins with my project of a multivolume philosophical theology, heavily dependent on philosophy and picking up on the experience of world religions, not Christianity alone or even primarily. The first volume in this project is On the Scope and Truth of Theology: Theology as Symbolic Engagement , which came out in 2006. It argues for theology as the critical engagement of first-order religious issues whose scope includes all the disciplines necessary to make and assess cases about these issues, including the sciences, arts, and practical disciplines. The rhetorical trajectory of that book comes from the concerns for religious symbolism and practice that characterized my middle period, although it was intended as a methodological prolegomenon to my systematic philosophical theology. My late period really began on May 27, 2009, during a flight from Dublin to Brussels. I had just given up the last administrative position of my career, the Executive Directorship of the Danielsen Institute, and was traveling to the Catholic University of Leuven to be outside reader on a dissertation. In a small moleskin notebook I began sketching the outline of three volumes of what would come to be called Philosophical Theology , volumes One , Two , and Three . The next several days I stayed up most of the nights re-outlining and organizing those volumes. I came home and began to write a first draft. By July when I was in Oxford for a conference I was up to chapters 5, 6, and 7, which I drafted in England. By the time of the AAR in November in Montreal I was drafting the introductory material for volume 2. By the first of March I began the draft of volume 3, which was finished on May 20, 2010, one week less than a year after the project began. This proves the authenticity of John E. Smith’s training in fast typing. The volumes are over 550 pages long each and they still require polishing and revision. But I can see now the shape of my late period should I live long enough to complete the publication of Philosophical Theology One Two Three . First, I argue that religion is a universal thing based in three items: common human biology, the possession of semiotic systems with intentionality, and five ultimate boundary conditions for human life that everyone has to deal with through some symbolic engagements or others. These ultimates include the radical contingency of the world on an eternal act of creation, the engagement of form as possibilities with alternative values, thus giving rise to obligation, the need to achieve some personal wholeness over the many components of life, the need to engage nature, institutions, and people in our existential field, and the need to come to terms with the complex values our identities achieve in the course of life. These items show up in issues of ultimate reality itself, in problems of human predicament, and in how to be religious and understand religion, the general topics of the three volumes respectively. Religions are different ways by which people have engaged these five ultimates, differing by culture, history, geography, and a host of other conditions. Religions as named, such as Buddhism and Christianity, are abstractions from actual religion. For any individual, the concrete religion available for investment and practice is a multilayered mix of traditions and counter-traditions, as well as odd circumstances. The way to understand the history of religions is from a given religious situation looking backward to see what has been formed as available for the multiple different religious locations in that situation. People need to relate ways of symbolizing ultimacy to the particulars of their lives, and thus need a sacred worldview that deals with their own lives. Unless people were all to be in the same social, geographical, and personal conditions, multiple religions are necessary, with concrete religious communities and memberships cutting across all sorts of named religious boundaries, such as Buddhism, Christianity, and secular life, to find like-minded sacred worldviews. Serious engagement with ultimate realities is an achievement, requiring virtuosity like an athlete in training. Mysticisms of various forms involve individuals, often under the discipline of some set of communities, turning themselves into signs and interpretations of those signs for engaging ultimacy. My late theology finds odious the prevalent theologies of confessional identity that provide narratives of conflict to teach people the boundaries of their religious identities. Those narratives at best can be abstractions from the real resources for engaging ultimacy and at worst are calls to arms. Mine is not likely to be a popular theology. But I am true to my roots. Christianity is one religion among others as I wrote in the church newsletter. Though too sentimental, Norman Vincent Peale in his Guidepost Magazine was right that real religion is what is ultimate in concrete life, not in some kind of paradoxical identity claim, but drawing on all the resources available for engaging the ultimate dimensions of life. My high school teacher Roy Dripps was right that God is not in time, and that this idea puts everything else in a new light. Praise to the electric shock of creation, gratuitous, arbitrary, undeserved, and surprising! Praise to the light that turns on time’s flow, nature’s churning, and our precarious felicity! What’s for the future? I hope to complete a theology of sexual identity that I’ve been working on with poor results for several years. After that I’d like to do a serious monographic study of value emphasizing aesthetic beauty and art.